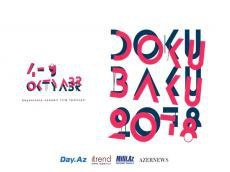 The second DokuBaku International Documentary Film Festival will be held in Baku on October 4-9. About 15 short and full-length documentaries will be presented at the festival. The main theme of DokuBaku 2018 is the crossroads of fates, concepts, worldviews, events and various phenomena of life. Everything can be different, but the general is still intersected at some point in time or space. Before the festival, a film "This is the voice of truth. Composer Gara Garayev" by Ogtay Mirgasimov dedicated to the 100th anniversary of the birth of prominent Azerbaijani composer will be screened at Baku IdeaLab on September 23, at 15:30. The screening will be held with the assistance of the State Film Fund. The event start at 6.30 pm. The film nightlights the composer's inner world, his creative work and pedagogical activity. The work includes unique footage of composer's creative work. A discussion with Ogtay Mirgasimov will be held after the film presentation. DokuBaku International Documentary Film Festival is a new independent film festival organized by a group of filmmakers on a voluntary basis. Within the framework of the festival there are screenings of films, master classes, as well as discussions and debates on social issues with the participation of local and international filmmakers. The main goal of the project is to encourage Azerbaijani filmmakers to create documentary films.